A message to Barack Obama voters: Research the connection between Barack and Michelle Obama’s Pastor, Dr. Jeremiah Wright. Wright supported terrorism by giving a platform to a terrorist. Some details below. The media are not reporting: (1) Pastor Wright’s affinity for and support of Musa Abu Marzook, a Hamas co-founder and leader, and (2) Marzook’s connection to the Council on American-Islamic Relations (CAIR), and CAIR’s documented connection to terrorism. Voters – think about it. Are you okay with electing a President who, for whatever reasons, supported this church with his time, his talents and his service? The purpose of this post is to show that Pastor Wright published a terrorist manifesto in his church bulletin on the “Pastor’s Page,” on July 22, 2007. The author of that manifesto is Musa Abu Marzook, who is solidly connected to CAIR. This post links Marzook’s various aliases, criminality and the Hamas Charter that Marzook passionately defends. Jeremiah Wright chose to promote the “Hamas stand,” within his Christian Church. The Anti-CAIR website is an important read for all who treasure American freedom. September 10th, 2003 will forever be remembered as a grim day for the Council on American Islamic Relations (CAIR). On that day, the eve of the second anniversary of the 9/11 attacks, CAIR faced up to its own terrorist connections. It ran away from testifying before an influential Senate panel that heard a barrage of incriminating evidence about the group and its connections. It saw one of its former officials plead guilty to terrorist-related crimes in Federal Court. And, it was stood up by two Department of Justice officials at an immigration symposium in Florida. CAIR should find it hard to recover from this string of defeats…. Senators turned out in force to connect the dots between CAIR and the deviant Islamic extremism that led to the vicious attacks of 9/11…. The Problem: The self-stated goal of Hamas (represented in Obama’s church by Marzook’s manifesto) is to rid the world of Israel, believing that Israel has no right to a home in the Holy Land. Palestine is the home of Hamas. Palestinians believe that Israel is occupying land that belongs to Palestinians. All Israeli’s are considered infidels, as are all persons who do not follow Islam. IsraPundit and BizzyBlog have been hot on the trail of verifying the “printed bulletin.” Both sites have posted jpegs of the TUCC bulletin, and you can view them by following the links to their websites. IsraPundit has posted comprehensively about Jeremiah Wright – all of which is essential reading for a voting American. I’m linking here to my transcription of the Hamas manifesto (transcribed from the above mentioned jpegs) printed on Wright’s “Pastor Page,” as well as some background in previous posts, Who and What are the Palestinians, which documents the history of Palestinian migration, and another post printing enlightening portions of the Hamas Charter. WARNING: As you read the manifesto as it was printed in Trinity United Church of Christ’s bulletin, you may feel ambivalent about it…or not see what all the fuss is about. The “fuss” also must consider that the facts prove that Palestinians are migrants, not refugees. History backs this up, no matter how diligently the world tries to revise history. The Los Angeles Times first printed Marzook-Hamas manifesto on July 10, 2007. 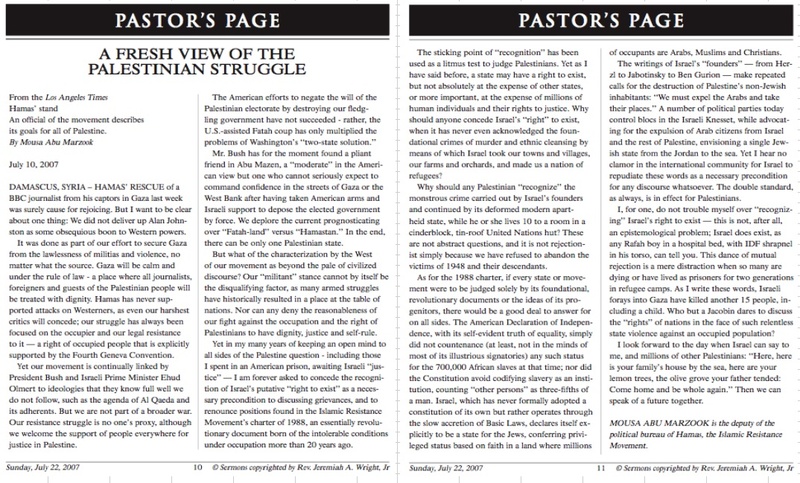 It was titled “Hamas stand.” Twelve days later, Jeremiah Wright changed the title to “A Fresh View of the Palestinian Struggle” and published it on his Pastor Page. During the meeting, Hamas was criticized for the drop in the number of its terrorist attacks (“resistance”) since its coming to power and the Hamas government’s lack of contribution to the resistance. Abu Marzouq retorted that, in reality, the situation was just the opposite: “It is the first time since the Oslo Accords that a Palestinian government supports the resistance [i.e., terrorism], does not go after the resistance operatives, does not arrest them, and does not hinder their activity”. Abu Marzouq even boasted of “quality” terrorist attacks perpetrated in Israel (“the Zionist entity”) during the Hamas government’s term, including the attack which led to the capture of a “Zionist soldier” (Gilad Shalit). 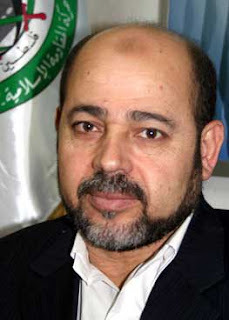 Musa Abu Marzouk is the Deputy Chief of HAMAS’s Political Bureau based in Damascus, Syria. His activities include directing and coordinating terrorist acts by HAMAS against soldiers and civilians in Israel and the West Bank and Gaza. Marzouk maintains relationships with other terrorist organizations. The Holy Land Foundation for Relief and Development, designated as an SDGT under EO 13224 in December 2001 based on its support of HAMAS, received start-up funding and instructions from Marzouk. Marzouk is implicated in receiving financing for HAMAS terrorist attacks, funds that have been used to mobilize military activity inside Israel and the West Bank/Gaza. a Hamas command center called the United Association for Studies and Research (UASR). Gained his Ph.D. in the United State[s] (1981-1991), where he gained residency rights. This explains, perhaps, the easy and fluent use of English in his writing. Palestine History confirms Marzook’s (Marzuq) explulsion from the U.S., as well as from Jordan. Musa Abu Marzuq was arrested at Kennedy Airport in July 1995 on charges of murder and attempted murder for Hamas,2 the other fundamentalist Islamic group that repeatedly engages in terrorist acts against Israel. At the time of his arrest, Abu Marzuq–a permanent resident of the United States for five years–headed a Washington-area think tank called the United Association for Studies and Research. The Holy Land Foundation for Relief and Development was founded by HAMAS leader Mousa Abu Marzook, a man who was deported by the United States to Jordan in 1997. Marzook, who may very well be, today, second in command of HAMAS, also founded, in 1981, CAIR’s parent organization, the Islamic Association for Palestine. This is important, when considering the previous questions asked, but – but – there is a much bigger connection to CAIR, with respect to the Holy Land Foundation. This piece goes on to say that the Holy Land Foundation was soon to be shut down by the U.S. government on terrorism related charges. Founding board member of Texas chapter funded Hamas – Ghassan Elashi, along with two brothers, was convicted in Dallas yesterday of channeling funds to a high-ranking official of the Palestinian terrorist group Hamas, Mousa Abu Marzook. The fact that Trinity United Church of Christ printed anything penned by Mousa Abu Marzook, and presented it in a Christian church sanctuary as a positive opinion and a “fresh” view, is in my opinion, traitorous and heretical. Who and What are the Palestinians? ← Who and What are the Palestinians?